As AT&T explains in this sponsored post, employee and customer engagement today calls for business-grade text messaging. Text messaging has become part and parcel of modern business life, an especially useful means of communicating information when timely response is the desired result. 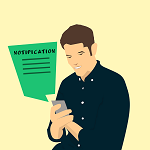 Safety alerts, real-time information updates, appointment reminders/confirmations, service scheduling, order status, password resets, marketing promotions... all these, and plenty more, now regularly find their way to workers or customers via text message. The ability to send text messages for such purposes is typically integrated into workforce and customer engagement workflows, automated via a process known as application-to-person, or A2P, messaging. If you can't tell from the number of business-related text messages arriving on your own smartphone alone, A2P is a booming market. IDC estimates the worldwide market for A2P messaging will grow from $27.2 billion in 2016 to $34.3 billion in 2019. That's a 26% growth in four years. Given the rising importance of text messaging, companies need to think strategically about how to incorporate the technology into their communications portfolio. Business-grade text messaging comes in a variety of deployment options: on premises, Web portal, API, text-enabled business lines, and Internet-based messaging applications. The goal should be selecting a solution that improves engagement with employees and customers, integrates with existing applications, and meets security and compliance requirements. Learn more about how business-grade text messaging can boost employee and customer engagement in the AT&T-sponsored IDC whitepaper, "Text Messaging Is Leading Edge for Business Efficiency."